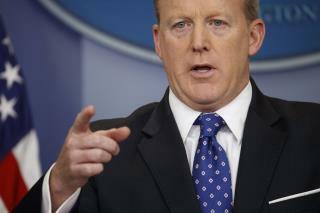 (Newser) – Sean Spicer has resigned as White House press secretary, the New York Times reports. Per the Times' source, President Trump offered the job of White House communications director to New York financier Anthony Scaramucci at 10am Friday, and Spicer resigned shortly after, telling Trump he "vehemently disagreed" with the appointment. The source says Trump asked Spicer to reconsider, but Spicer refused, calling Scaramucci's appointment a "major mistake" and refusing to take a position under him. The Times frames Spicer's resignation as a "blow" to White House chief of staff Reince Priebus, since Priebus brought Spicer in while Trump was initially unsure of his loyalty; Priebus and Spicer worked together for years at the Republican National Committee. Another totally unqualified appointment with Mooch. Typically a communications director MIGHT have a degree in oh, say, communications...or ANY related field and not just be a Wall street financier. Obama's CD was the managing partner of a global strategy group, had various positions in the press, worked on his campaigns for a decade, worked in the State Department, and was a spokesman for the Secretary of State. THEN she became the CD. But that's not how trumpy does it. He just plays golf with some doosh that laughs at his jokes and so he offers them a high position in the US government and gives them top level security clearance. And then wonders why his administration had to install a revolving door in the West Wing. There should be a sign over the door at the white house: "Enter in Fame, Leave in Shame."